View More In Tissue Pom Poms. ★PACKAGE INCLUDED - This party decoration set includes 8 pcs tissue paper flowers, 20 pcs tissue tassels and 2 pcs circle paper garland. paper tissue flowers set will light your party and make high impact. Perfect for dessert tables Backdrops and overall party space. ★DIMENSION & COLOR - Tissue paper flowers come in size 8inch and 10inch. 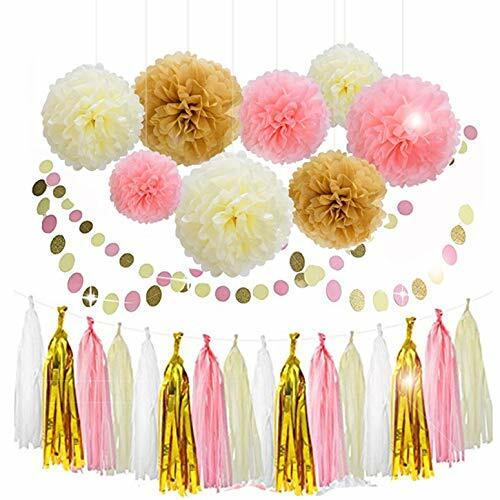 Tissue pomp poms, tassel and garland are with different bright colors: light pink, white, cream, gold glitter. ★GREAT MATERIAL - This tissue paper flowers pom pom is using premium paper kit, could be used multiple times. it is versatile coloring that would match multiple décors. Each set comes flat packed with white ribbon and instructions. It is versatile coloring that would match multiple décors. They're also fabulous to use as a photography backdrop. They can also be used as table centerpieces. ★EASY TO OPERATE - It's pre-folded and pre-cut, all you need is fluffing them and hang on a window, ceiling, Hang on tables, walls, in doorways or across aisles. ★COMPATIBLE OCCASION - Light up your Wedding Ceremony, Bridal Shower, Baby Shower, Birthday Girl Party, Celebrate your Birthday, Home décor, Fiesta, indoor and outdoor supplies decorations. If you have any questions about this product by Lansian, contact us by completing and submitting the form below. If you are looking for a specif part number, please include it with your message.